I’ve been thinking about long-term relationships with brands and how they’ve changed over the years as a result of online communications and, specifically, how that has allowed some brands to become integrated into much of our existence. My relationship with a brand of football cleats is developed when I shop for them and it is reinforced every time I put them on to play football. But I don’t wear them every day; and even if I did, when I’m wearing them, I’m not exposed to the brand. Online brands are different that way, especially those brands that provide some type of utility. Yahoo! has woven itself into practically my everyday experience from the start. I first went online in 1993 through various online services like CompuServ and AOL but by 1994 I was ready to ditch the training wheels after I kept reading about this remarkable new thing called the World Wide Web. My first ISP was through the Pioneer Press‘ partnership with InfiNet and it was through my open connection to the net that I was first introduced to Yahoo! My installation disc included software for the Netscape browser whose default home page was the Yahoo! Directory. So, Yahoo! was integrated into my online experience as I first really explored the Web. I remember the sense of wonder as I navigated Yahoo!’s categories of sites: newspapers from around the world! museums’ collections!, all at my fingertips. One aspect of online marketing was search engine optimization before SEO was a defined concept. SEO at that time involved ensuring you included the right keywords on your Web site and within your keyword meta tags but, more importantly, it involved crafting keyword rich copy for your all-important Yahoo! directory listing. I was an early user of eGroups, the mailing list hosting provider that eventually was purchased by Yahoo! and renamed Yahoo! Groups, which I use to this day. I was an early Rocket Mail user, which was bought by Yahoo! and transformed to Yahoo! Mail, which I also use to this day. I created a Geocities site. I enthusiastically adopted My Yahoo! and still use it. I was an early user ofÂ Yahoo! 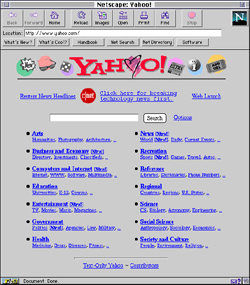 Bookmarks but absolutely loved Yahoo! MyWeb and was sorry to see it shut down. Back in the day, I set up and optimized a Yahoo! Store for a company called SoccerDocs and found a High Def TV through Yahoo! Shopping. I used theÂ Yahoo! Search Marketing Pay For Inclusion program to great effect for a Prom Fashions project for Mall of America. I uploaded and optimized a Joe Mauer batting training video to Yahoo! Video and often use it to find videos for my Videolicious.tv video blog. I use Yahoo! Alerts daily. Yahoo! News and Yahoo! Sports are daily go-to sites and I make a point of checking the popular searches, the most emailed, most viewed, and most recommended stories there. I’ve retrieved directions from and optimized business listings for Yahoo! Local. I love Yahoo!’s fantasy sports for its usefulness but I always end up being bummed there ’cause I always lose. I use Yahoo! Site Explorer for its analytics, I’ve experimented with search ads with Yahoo! Search Marketing, and I’ve messed around with Yahoo! Pipes. When I stop to think about it, I’ve interacted with a Yahoo! brand probably nearly daily since 1995.Â That’s about 15 years of constant exposure and that’s pretty amazing. Ever since I got my yahoo mail account, I have used yahoo. The mere inertia of having that as my personal email account has kept me a customer. I have expanded to My Yahoo and love the Fantasy Sports option. I’m not total Yahoo fanatic, but I am a daily user.